Every so often, TV characters will become so popular that someone will think it's a great idea for them to release a single. On this blog alone, we've seen hit records by Kylie Mole, Neil from The Young Ones and ALF. This week in 1991, the most popular TV character of the year debuted on the ARIA top 50 with a spin-off single. For me, it was every bit as awful as those other TV-related songs. Naturally, it went to number 1. At number 1 this week in 1991 was "Ice Ice Baby". The Vanilla Ice single spent its third and final week on top as two future chart-toppers moved in for the kill. They were asking for it with this song title - and the subtleties of "Being Boring" were even lost on a massive PSB fan like me at the time. Although a chart failure, it's gone on to be one of the duo's most beloved tracks. Number 98 "Feels Good" by Tony! Toni! Toné! In the US, this song was the breakthrough hit for the new jack swing trio featuring brothers Dwayne Wiggins and Raphael Saadiq, and cousin Timothy Riley. In Australia, it'd be two more years before their time came. More hair metal-lite from the twins with the longest hair in the business - but unlike their previous single, the title track of their debut album didn't catch on in Australia. In the US, "After The Rain" reached number 6. The second of three versions of "What Time Is Love?" released by The KLF, this remix of the 1988 original made the UK top 5 but failed to ignite much interest locally - despite a re-release following their later chart smashes. The latest single from Hothouse Flowers' Home album ended up being overshadowed by the return of "I Can See Clearly Now", which re-entered the top 100 the following week on its way to becoming the band's biggest Australian hit. New track "Never Enough" had kicked off the promotion for The Cure's remix album, Mixed Up, but the band delved back into the past for the follow-up. A number 7 hit in early 1986, "Close To Me" was one of the band's most popular songs and pretty flawless in its original form. This minimalist version came with a completely new video, which continued the story of the band's experience in (and out of) the original clip's closet. It'd worked a treat for Absent Friends - giving the Australian supergroup their first and only major hit in "I Don't Want To Be With Nobody But You". But, would covering an old soul track from the 1970s be just as good a move for former Absent Friends singer Wendy Matthews? Originally released by Bobby Womack in 1972, "Woman's Gotta Have It" was chosen as the second single from Wendy's Émigré album - but perhaps it was too laidback a tune to grab the attention of the public in the way that ballad "Token Angels" had and her next, more upbeat single would. 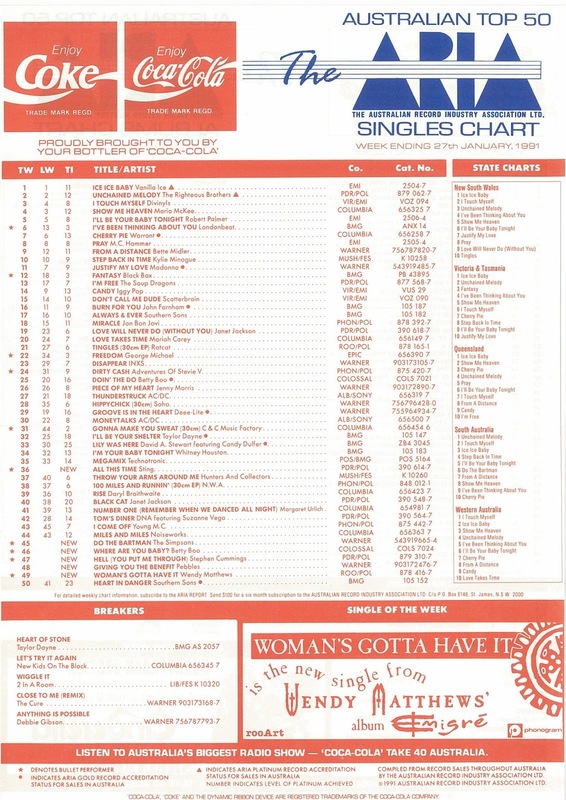 A brief in-and-out appearance on the top 50 for this US top 5 hit from the singer born Perri McKissack. "Giving You The Benefit" was yet another production by Pebbles' then-husband, LA Reid, and his partner in song, Babyface, that didn't cross over in Australia - and the lead single from her second album, Always. Once she'd finished promotion for the album, Pebbles turned her attention to the launch of an all-girl trio she'd signed to her fledgling management company, Pebbitone. You might have heard of the group: TLC. It'd been seven years since former The Sports singer Stephen Cummings had ventured inside the ARIA top 40 - despite releasing a steady stream of singles and albums in the intervening years. And, although "Hell (You Put Me Through)", which harked back to the sound of debut album Senso, broke his hit single drought, it was nowhere near as far-reaching as the "I Feel Better Now" jingle he co-wrote the previous year for Medibank Private. Just as "Doin' The Do" was sliding down the chart, Betty Boo's second solo single charged into the top 50. The same mix of cutesy and feisty, "Where Are You Baby?" wasn't as huge as its predecessor, but it solidified the British rapper as one of the most exciting new artists of the time. Then it all went wrong. During a promotional tour in mid-1991, Betty was caught out lip-syncing when she dropped her microphone during a short set in a Melbourne nightclub. Even though dance acts like Betty were hardly selling records on the basis of their live performance skills, such obvious miming was a massive no-no in a post-Milli Vanilli world. The scandal destroyed any hope that the performer born Alison Clarkson would ever have another big hit in Australia. Remember when The Simpsons was new and exciting? In 1991, it was a cartoon series like nothing we'd ever seen before. Irreverent, topical and with characters that were far from good role models for children - it's little surprise that the animated show quickly developed an audience of fans that spanned several generations. The most popular of those badly behaving characters - at least initially - was 10-year-old Bart, whose catchphrases were just waiting to be put to music. In the end, however, it wasn't "Ay Caramba!" or "Eat My Shorts" that became Bart's spin-off single but a DJ Jazzy Jeff & The Fresh Prince-style rap called "Do The Bartman", which came with an accompanying dance. 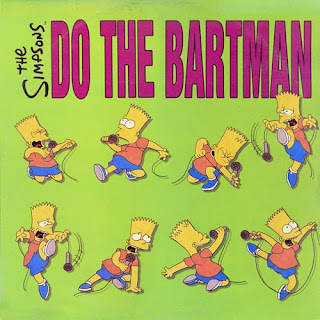 The Bartman may never have taken off as a dance craze, but the single raced to number 1 in Australia and the UK, and likely would have done the same in the US if it had have been released as a commercial single there. Although he's not credited on the track, big Simpsons fan Michael Jackson actually co-wrote "Do The Bartman" and provided background vocals, but the terms of his record contract with Sony Music prevented his official involvement. He last appeared on the Australian top 50 in 1987 with "We'll Be Together", the lead single from the ...Nothing Like The Sun album, and in 1991, Sting returned to the chart with the first release from The Soul Cages. Once again, it would be the only single from the album to make the top 50. Despite its cheery sound, "All This Time" - and, in fact, the entire album - was written about the death of Sting's father. Next week: the world's biggest boy band received a much-needed musical makeover. Plus, a dance/rap hybrid becomes the latest one-hit wonder on the ARIA chart. I didn't hear 'Being Boring' until buying the Pet Shop Boys' 'Discography' album in late '91. I thought it was quite boring and would always skip it. It's grown on me slightly, but still isn't a favourite. I actually prefer the acoustic Merrill Bainbridge cover, despite its "casual photo" lyrical error. I forgot that I knew 'Feels Good' until hearing it again in the 00's. I wouldn't have heard 'After the Rain' since 1991. Interesting video opening scene. 'What Time Is Love' deserved to do much better here. I've been after the 'Movies' video and didn't notice that someone had uploaded it. The 'Close To Me' remix was unnecessary, but it's not bad. I like 'Woman's Gotta Have It', but I'm surprised it did even as well as #34. It really doesn't sound like the kind of song I can picture kids/teens (surely the primary singles market) rushing out in droves to buy. 'Giving You the Benefit' deserved to do much better here. The chorus of 'Hell...' almost sounds like it would make a good jingle. Somehow I didn't hear 'Where Are You Baby' until it entered the chart; but when I did, it instantly sounded familiar. A few months earlier, I bought a copy of UK pop magazine Number One, which (unusually for its import to Australia) came with a free flexi 7" disc of Betty performing an anti-smoking rap (as was the cover and theme of her interview in the issue). You can hear it here - https://www.youtube.com/watch?v=PhbetjqL-AE . If I remember correctly, The Simpsons didn't debut on TV here until some time in February (maybe even March). 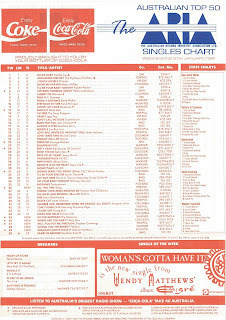 Yet, because of the advertising hype leading up to the debut, 'Do the Bartman' hit the charts beforehand. I, slightly embarrassingly, bought the cassingle - even though I never really watched the show after seeing the debut episode and not finding it particularly funny (maybe I just didn't get the humour yet). 'All This Time' is another single I can't picture anyone under, say 25, rushing out to buy. Maybe 'adults' were snapping up pre-album singles like this back then? Do The Bartman didn't jump into the top 10 until late Feb and then reached number 1 in mid-March, so the timing tallies up nicely. But I too seem to remember there being a lot of hype leading up the show so that when it started, we already knew the characters etc. The After The Rain video is just bizarre. Song's better than I remember though. Merril's mistake in the BB lyrics just makes her look a bit simple. I didn't mind her version, though. And the PSB song has really grown on me over the years. Being Boring is an aptly named title for the track but it's probly a stand out for me from this era, surprised it didn't do better on the charts. Tony! Toni! Toné! debut isn't something I remember and I wasn't expecting it to be so repetitive and weak in comparison to their big hit If I had No Loot!. After The Rain is really MOR fodder and an attempt to sound serious which unfortunately for them bombed and rightly so. Out of all the hard electronic acts that came from this era I really liked a lot of The KLF's stuff and What Time Is Love? is no exception. Movies to me doesn't sound like a single and is probly an afterthought? It's a nice track and all but I never knew it was released or even charted until today! Loved the album it comes from and know the track well so chuffed it did. For years I've been chasing a Cure clip with them performing underwater in an aquarium situation and now i've found out what it was (thanks GavinScott). The track it's self in original form is a classic but this was pointless. Never got anything out of Woman's Gotta Have It in all honesty. Stephen Cummings I'm not familiar with so this track is very obscure to me so i'll pass on judgement on this one and won't be so harsh. It's ok but I wouldn't lose any sleep if I didn't hear it again. I hated Doin' The Do so I wasn't expecting to like the follow up which is a really cute and poppy delight I still enjoy today. Hahahaha Do The Bartman, it really is a bit of harmless fun but it really is a horrible #1 meaning their are worse, it just doesn't scream #1. I remember one New Year's Eve in the early '90s I counted down to the new year, then turned the TV on to, naturally, Rage. The video that was playing as the year changed was Stephen Cummings' "Hell" – what a way to start the year! The ABC had no on-screen clock; someone just added a loud gong sound at the stroke of midnight.